The plot is based around an unnamed protagonist who struggles with his growing discomfort with consumerism and changes in the state of masculinity in American culture. In an attempt to overcome this, he creates an underground boxing club as a new form of therapy. The novel was made into a movie of the same name in 1999 by director David Fincher, which resulted in the story becoming a pop culture phenomenon. A reissued version of the novel was published in 2004 that begins with an introduction by the author which talks about the conception and popularity of both the novel and the movie. When Palahniuk made his first attempt at publishing a novel (Invisible Monsters) publishers rejected it for being too disturbing. This led him to work on Fight Club, which he wrote as an attempt to disturb the publisher even more for rejecting him. Palahniuk wrote this story in between working while on the job for Freightliner. After initially publishing it as a short story (which became chapter 6 of the novel) in the compilation Pursuit of Happiness, Palahniuk expanded it into a full novel, which, contrary to what he expected, the publisher was willing to publish. While the original, hardcover edition of the book received positive reviews and some awards, it had a short shelf life. Nevertheless, the book had made its way to Hollywood, where interest in adapting it to film was growing. It was eventually adapted in 1999 by screenwriter Jim Uhls and director David Fincher. The film was a box office disappointment (although it was #1 at the U.S. box office in its first weekend) and critical reaction was mixed, but a cult following soon emerged as the DVD of the film was popular upon release (with some critics changing their opinions on it as a result of the DVD). As a result of the film, the original hardcover edition became a collector's item. Two paperback rereleases of the novel, one in 1999 and the other in 2004, were later made. This success helped launch Palahniuk's career as a popular novelist, as well as establish a writing style that would appear in all later books by the author. Despite popular belief, Palahniuk was not inspired to write the novel by any actual fight club. 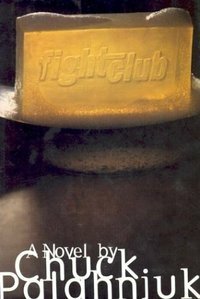 The club itself was based on a series of fights that Palahniuk got into over previous years (most notably one that he got into during a camping trip). Even though he has mentioned this in many interviews, Palahniuk is still often approached by fans wanting to know where their local fight club takes place. Palahniuk insists that there is no real, singular organization like the one in his book. He does admit however that some fans have mentioned to him that some fight clubs (albeit much smaller than the one in the novel) exist or previously existed (some having existed long before the novel was written). Prices current as of last update, 04/17/19 9:14pm.